When thinking of Deus Ex Machina, the thoughts often revolve around custom motorcycles and surfboards right? 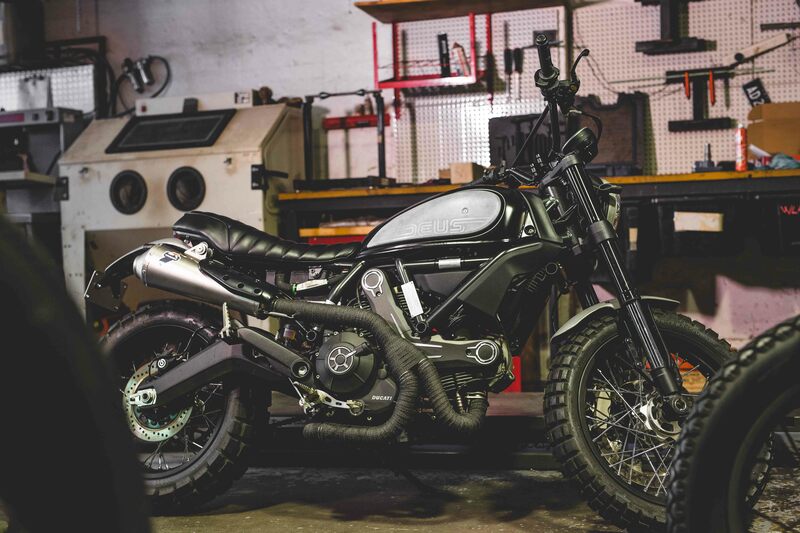 Well that’s exactly what we have here, a tastefully altered Ducati Scrambler with the capability of making a surf trip, long or short. 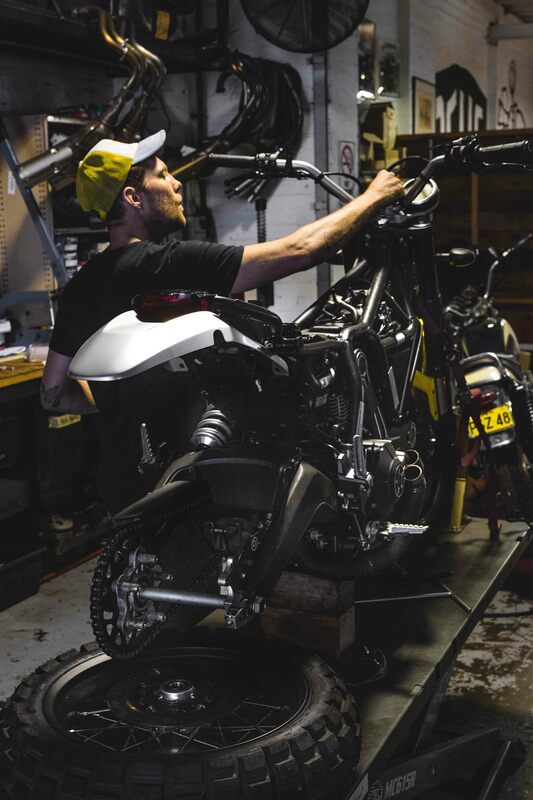 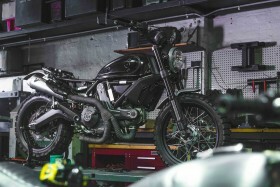 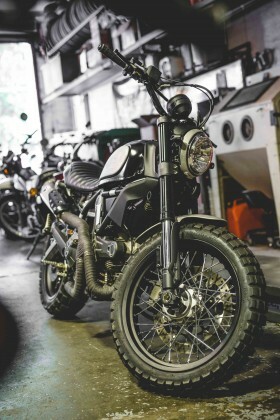 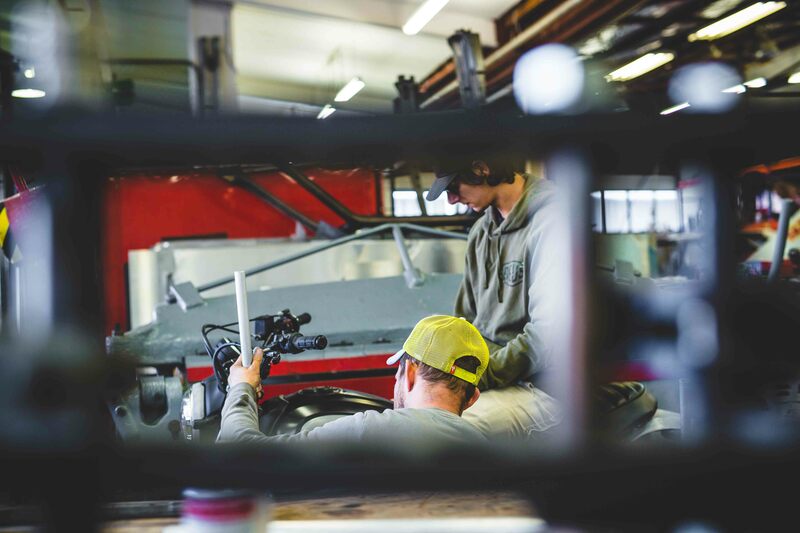 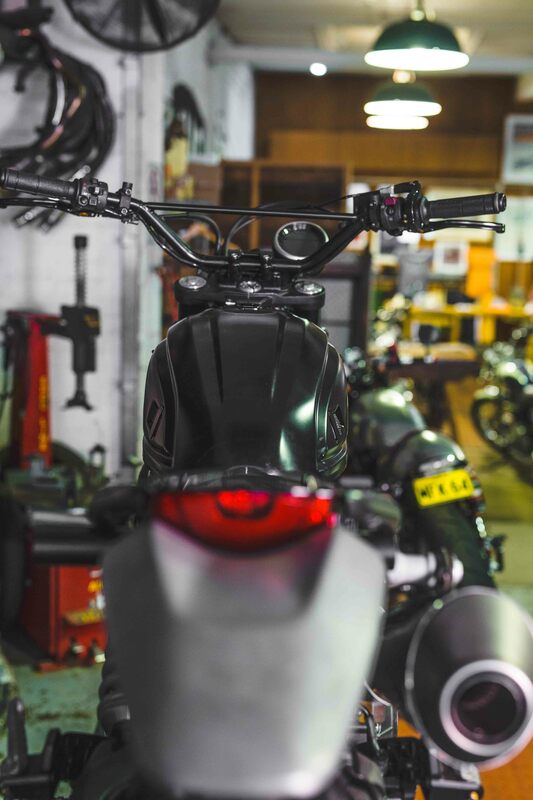 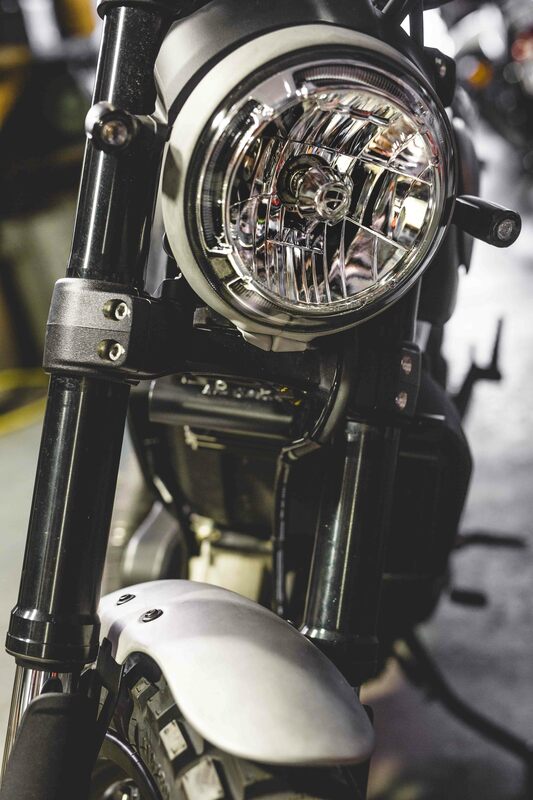 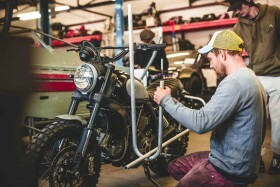 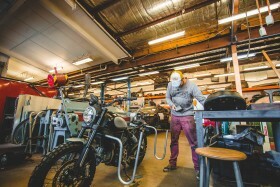 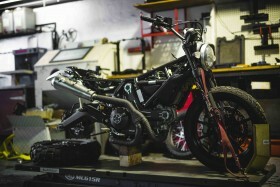 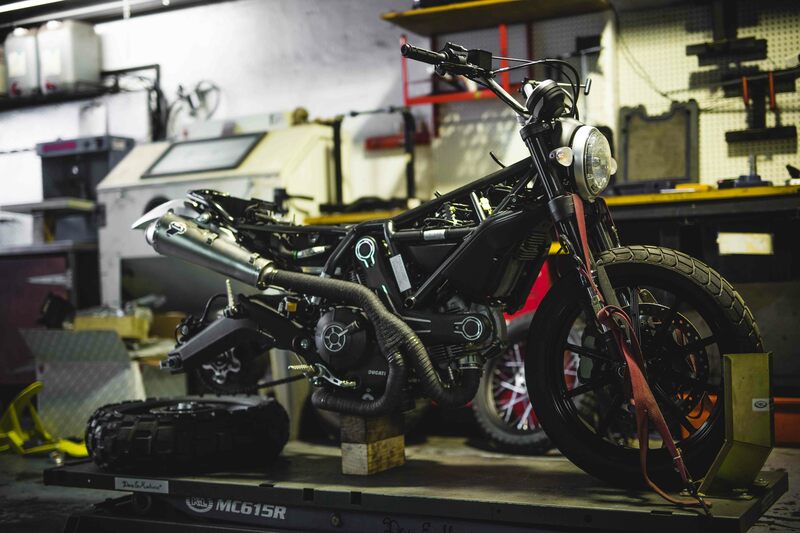 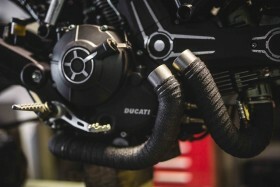 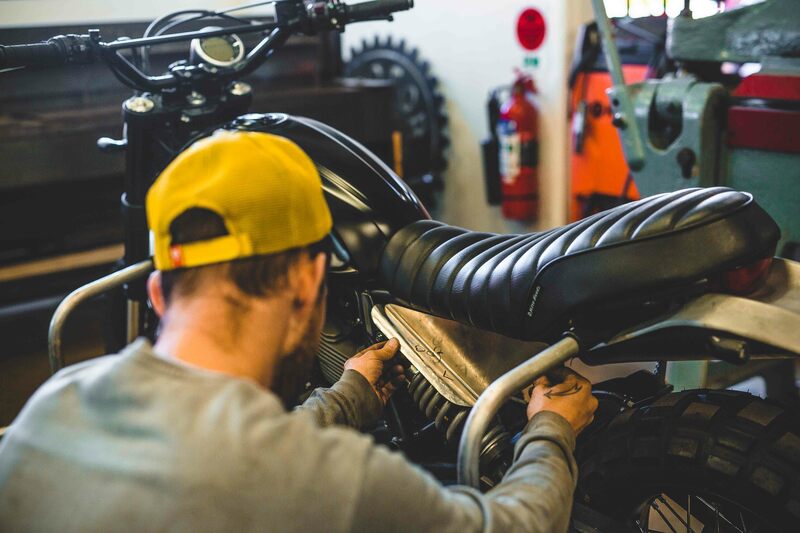 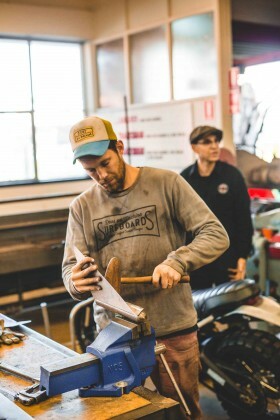 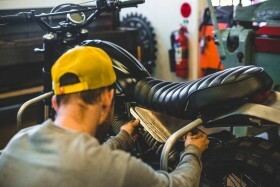 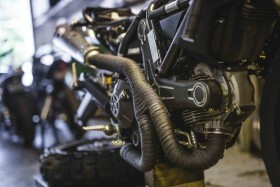 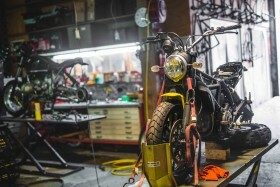 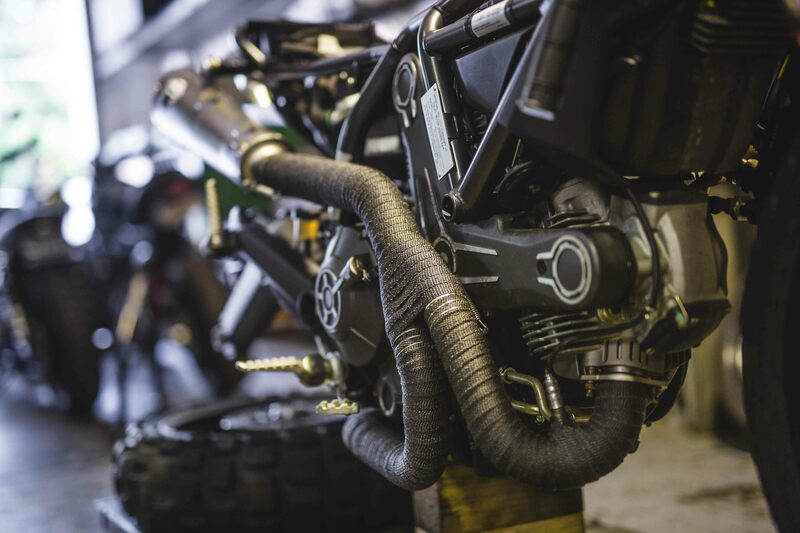 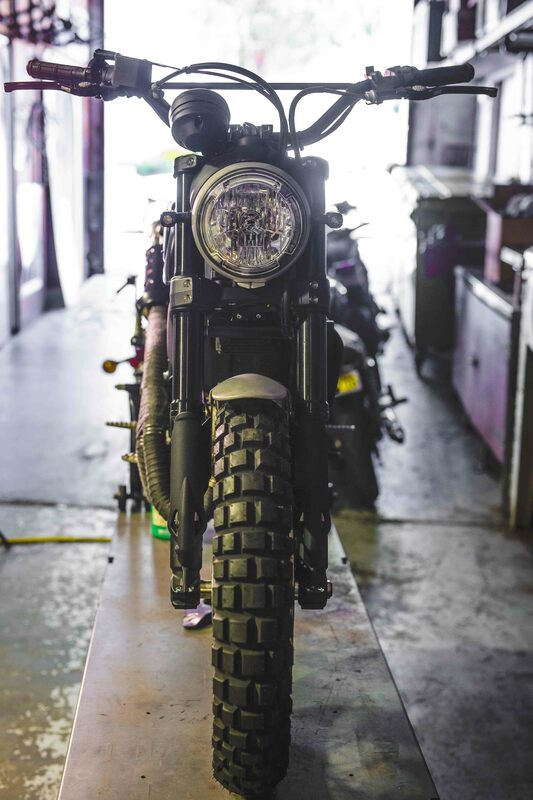 With the support of Ducati Australia and New Zealand as well as the motorcycle media gods, Transmoto, documenting the whole process we were able to proceed and capture our hearts dream in making a Scrambler well worth wearing the Deus badge. 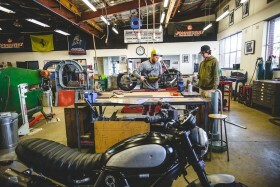 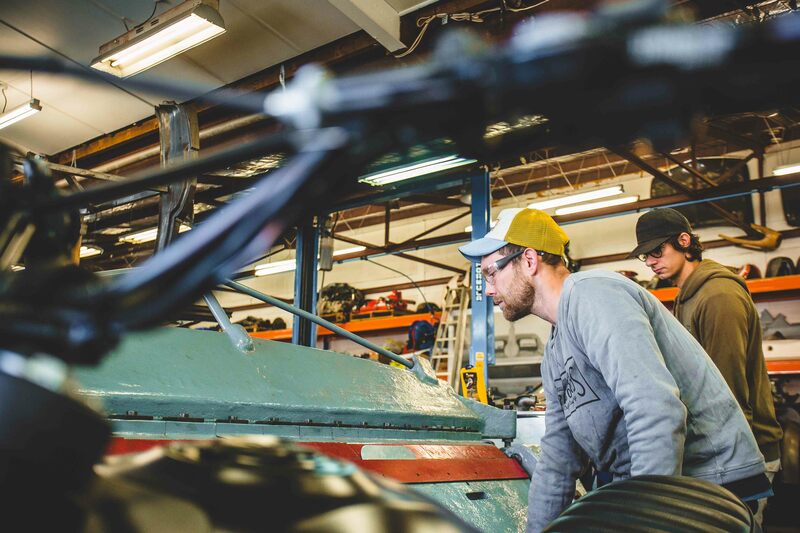 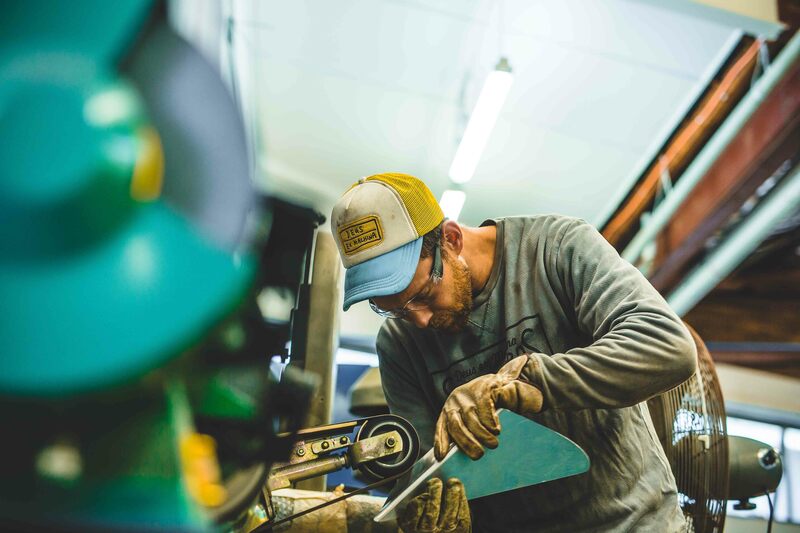 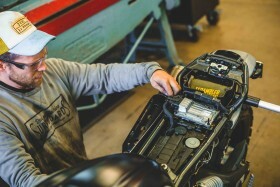 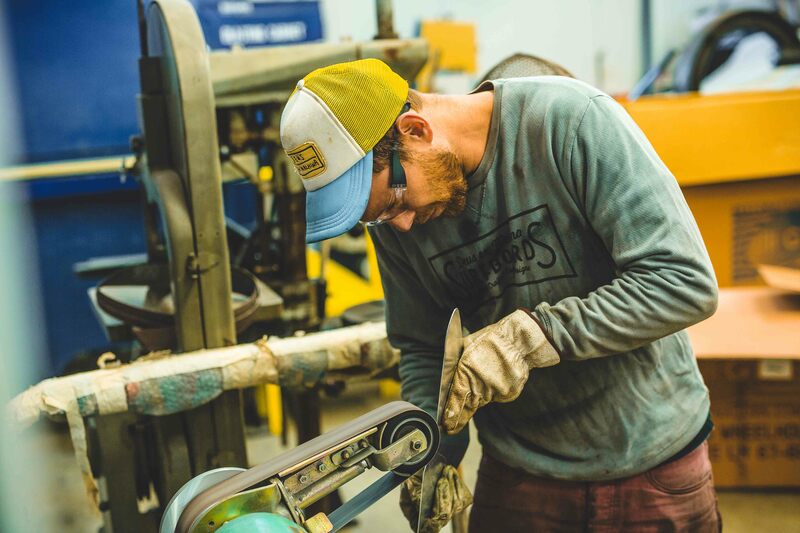 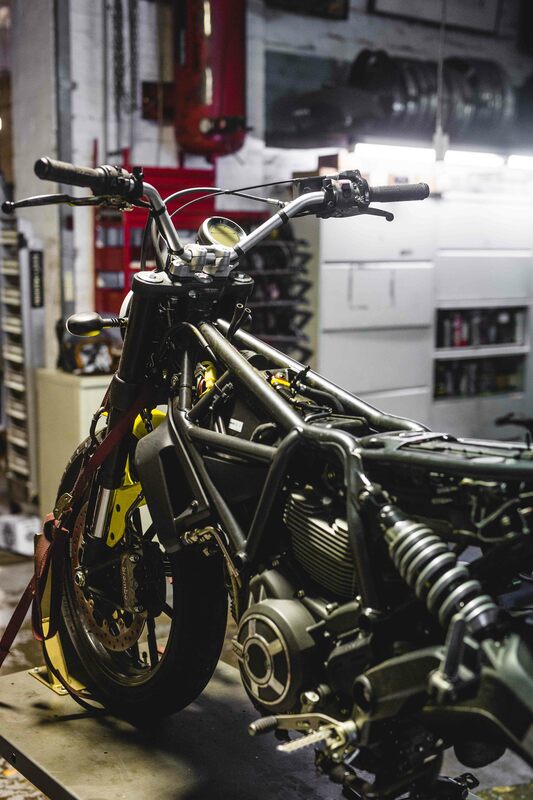 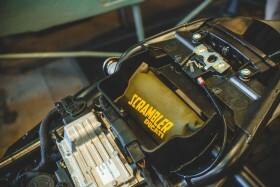 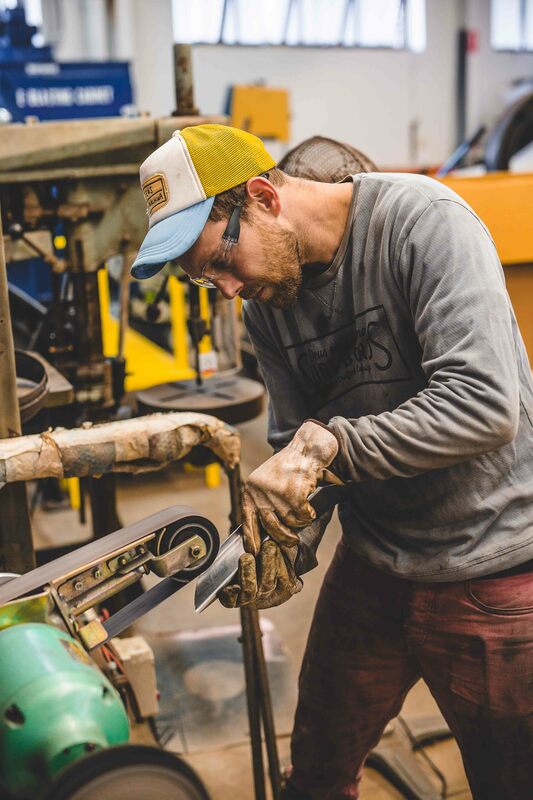 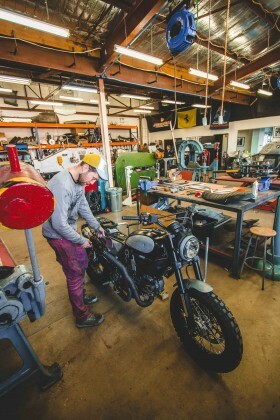 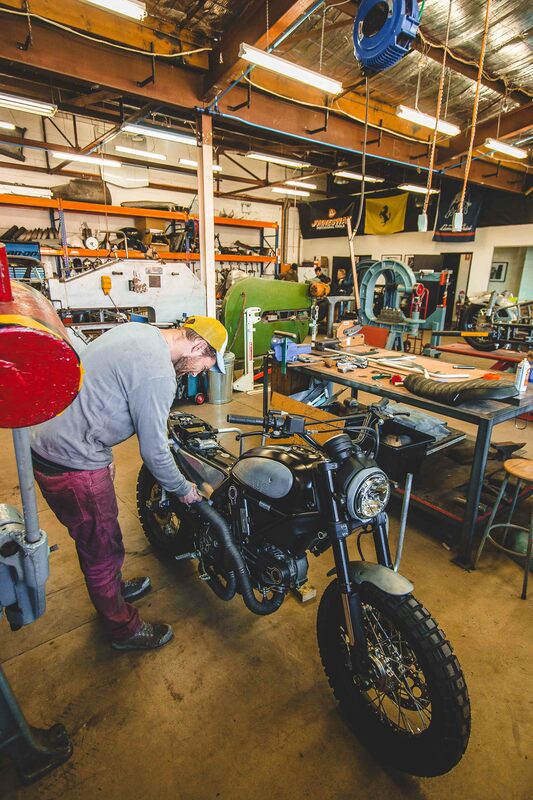 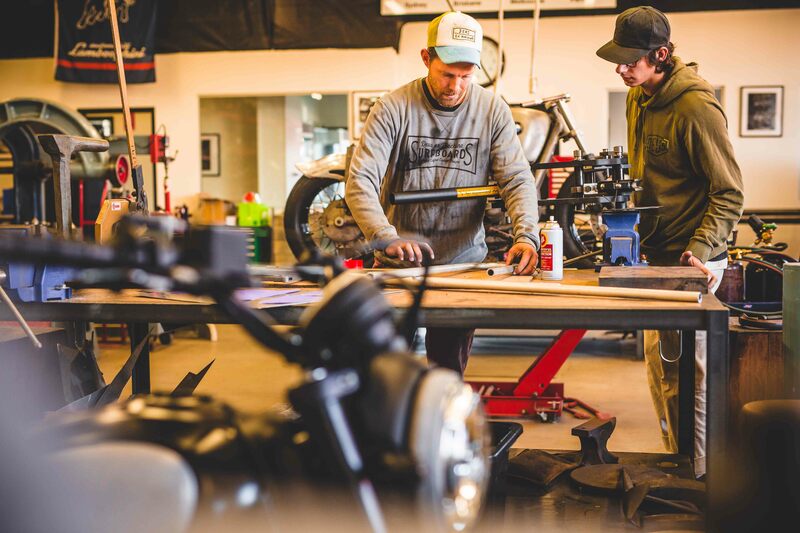 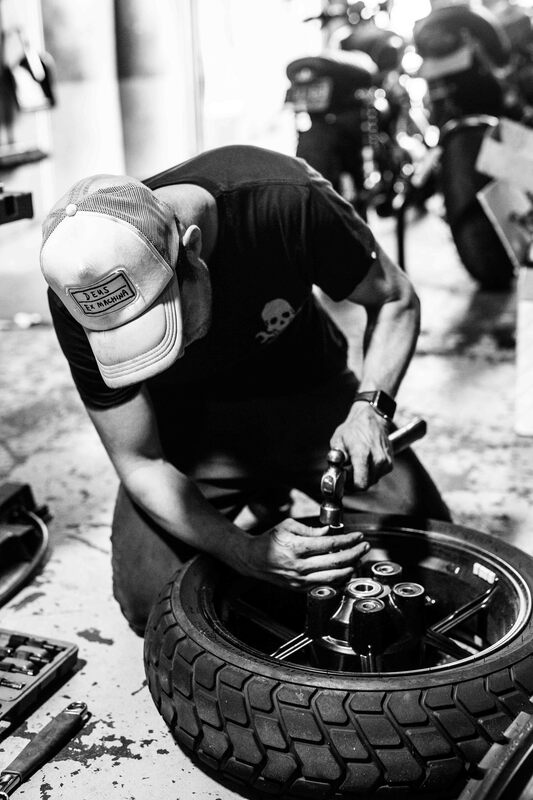 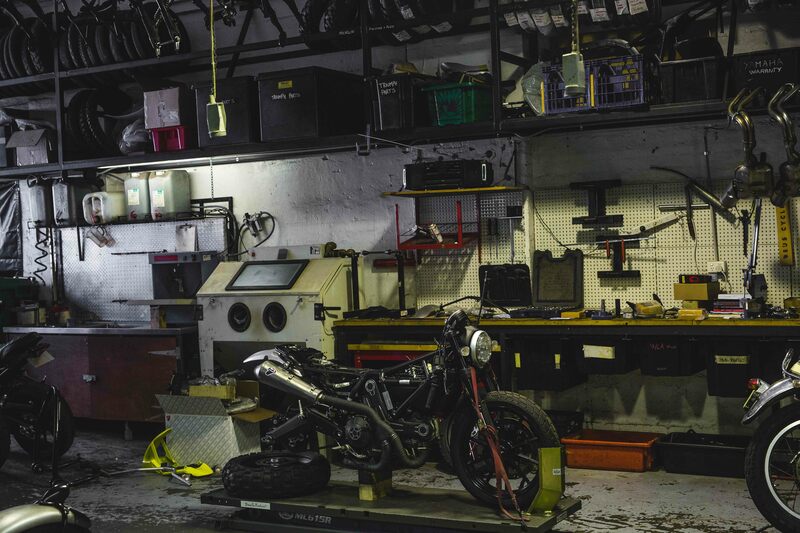 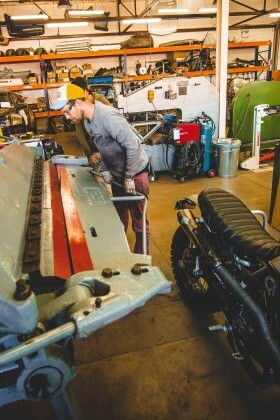 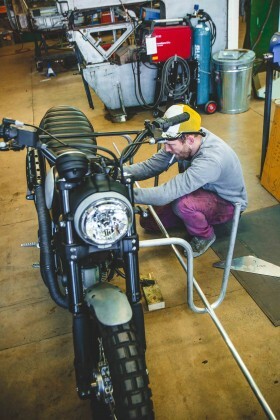 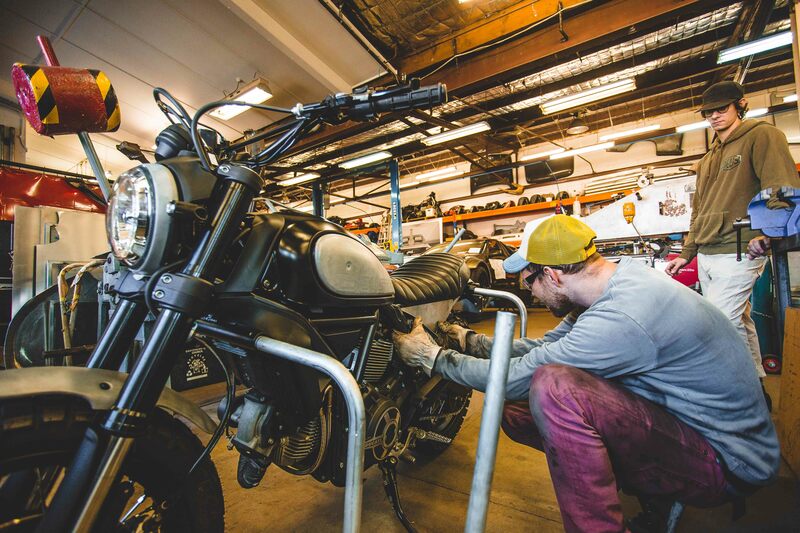 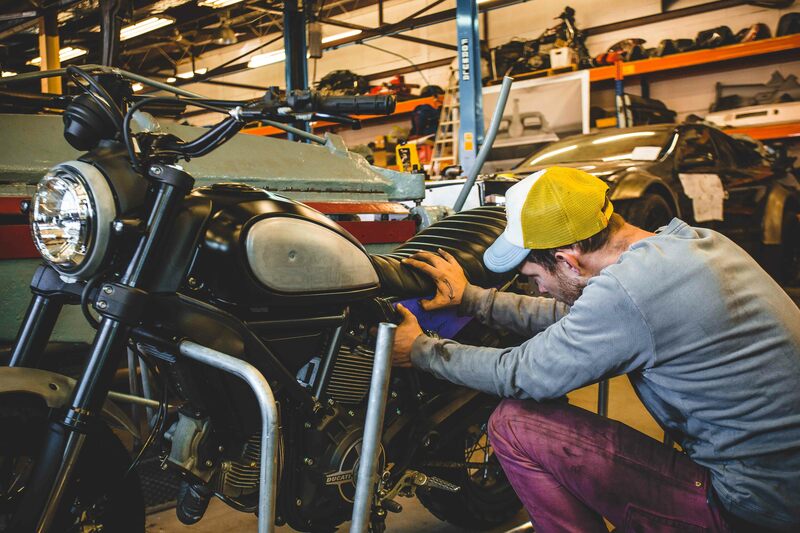 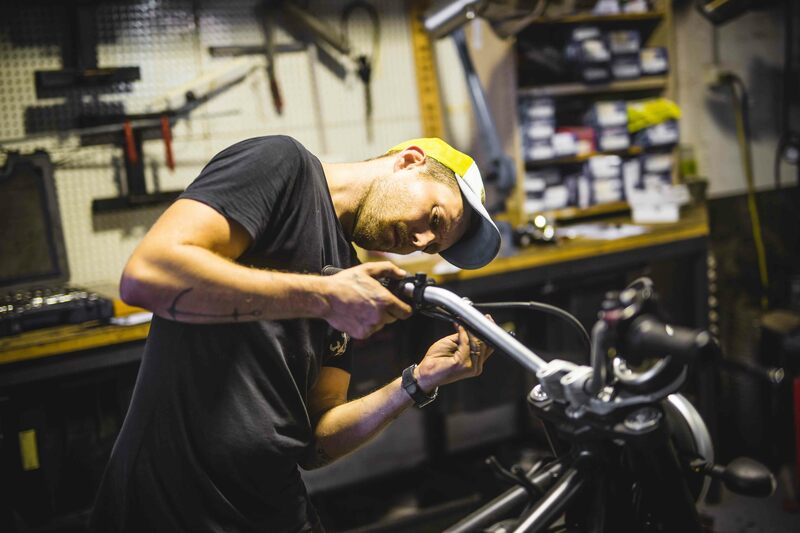 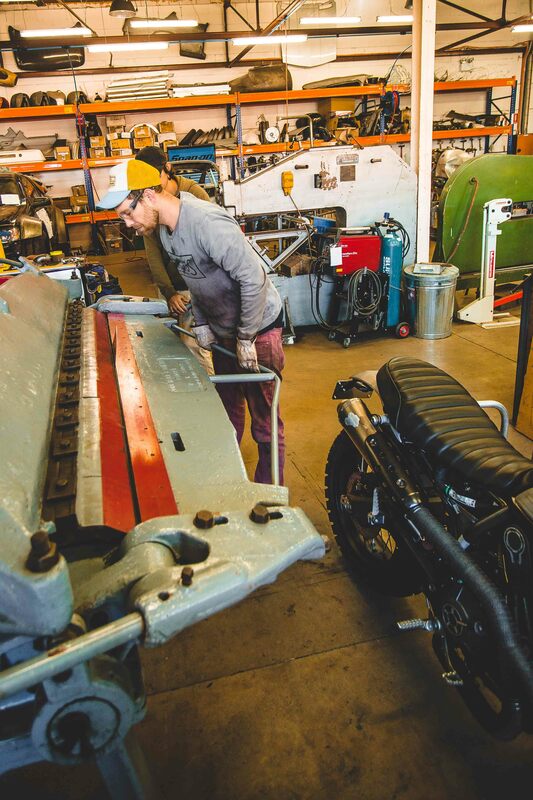 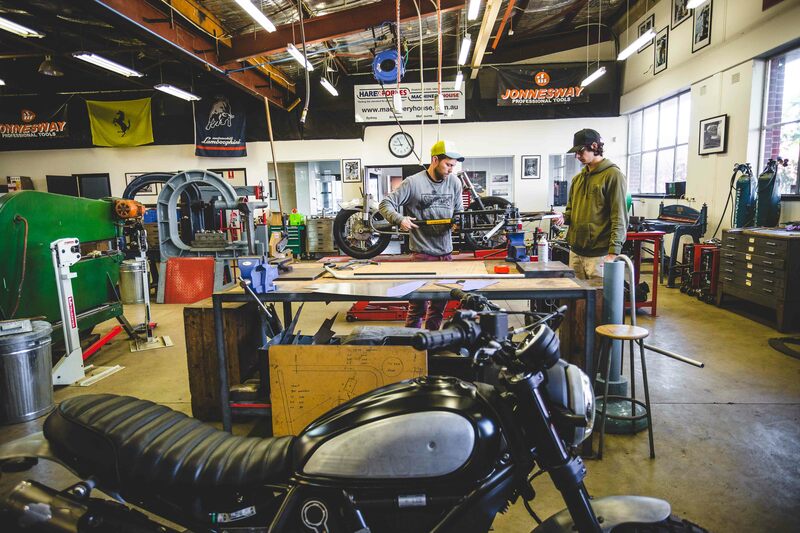 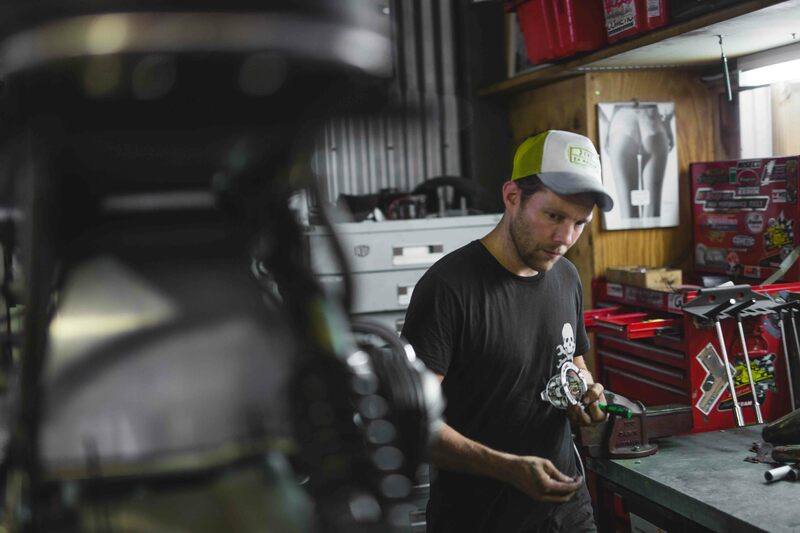 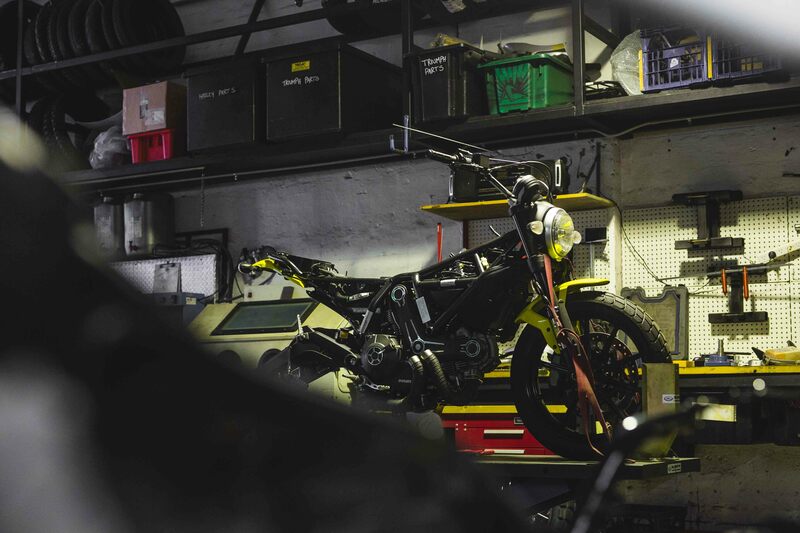 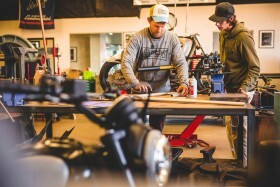 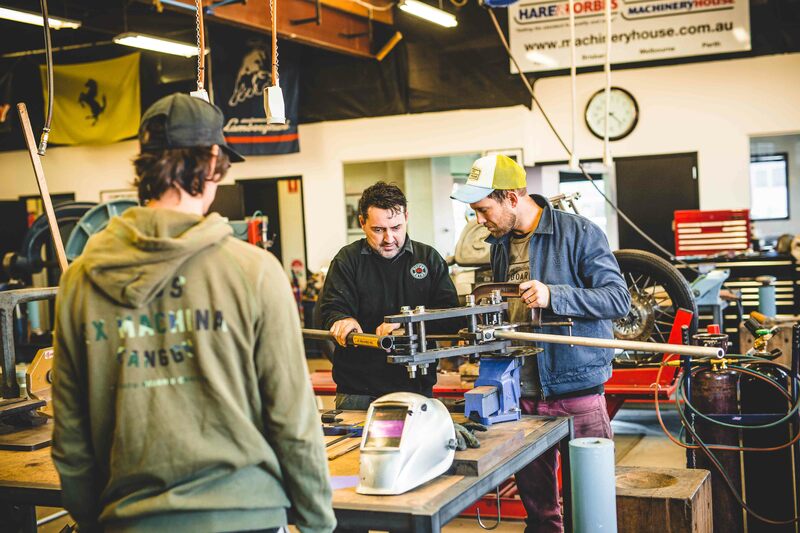 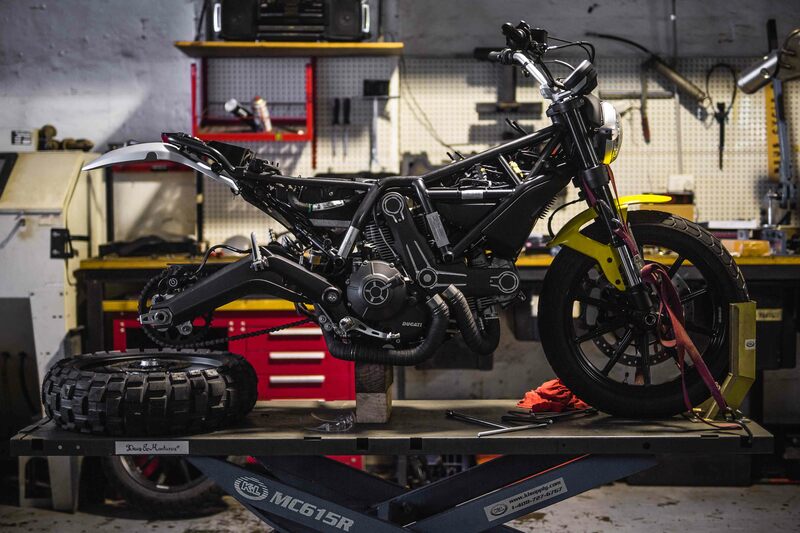 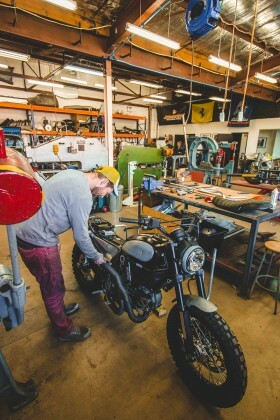 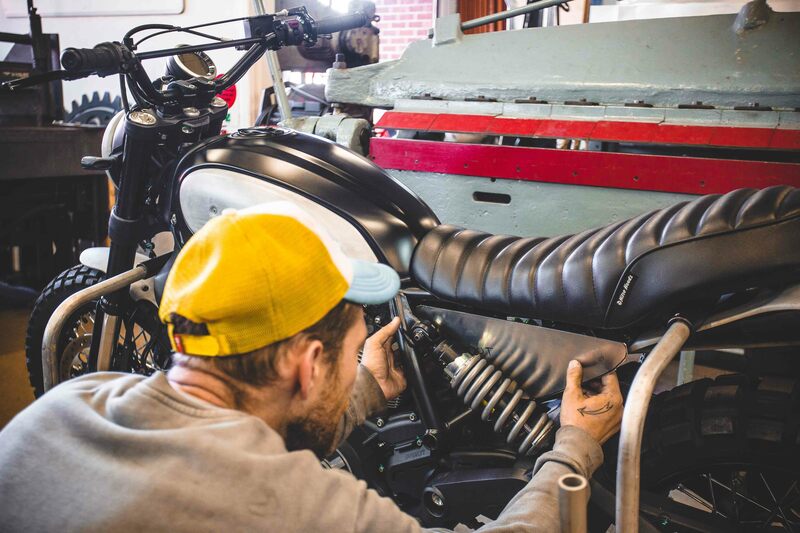 Head mechanic, Jeremy Tagand, started off with a yellow Ducati Scrambler ICON. 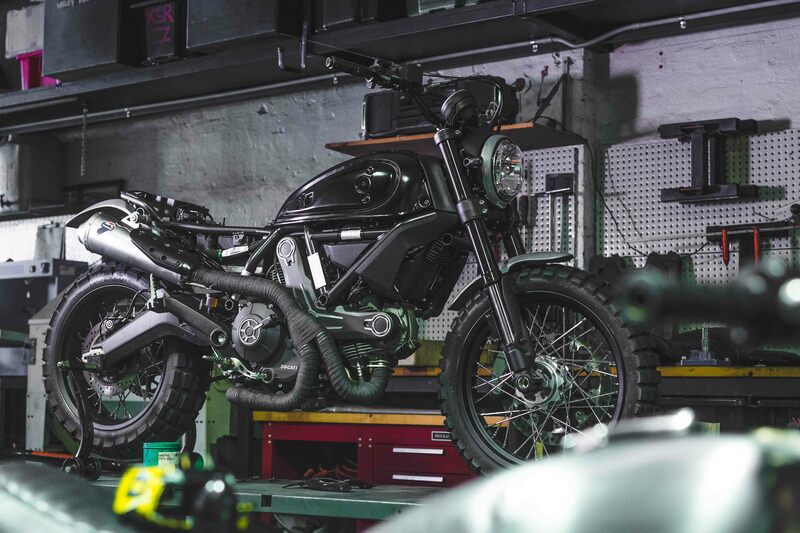 A sweet little bike but needing a bit more flavour we jumped on the blower and ordered a bulk of parts straight from Ducati themselves. Once arrived we pounced and opened the boxes and laid out all the parts, all of which were of extremely high quality and evident that Ducati continues their standards into their parts. No doubt, right? The tank was sent off to get licked with some satin black paint so we removed the original mag rims and went with the spoked versions and finished by wrapping them in Continental Twinduro tyres. Twinduro’s, if you’re wondering, are both for the road and dirt. 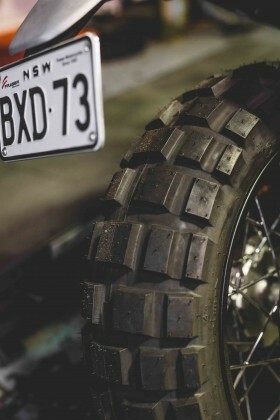 They’re bitchin’. 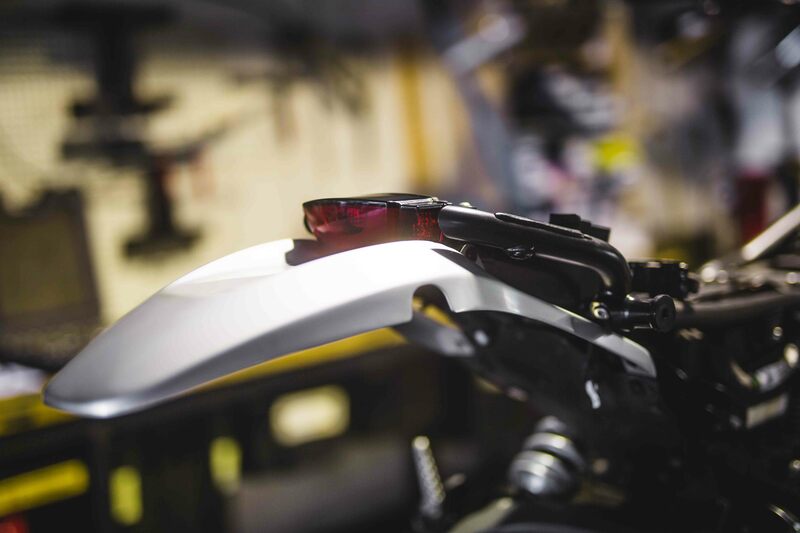 The Handle bars, Termignoni exhaust guard and a few other bits and bobs were treated to a change with gloss black powder coating along with the rear guard losing some weight with a trim, courtesy of the steady hands of Jeremy. Once the tank came back from Dutchy’s Paintwork and into our sights we could see the finish line and the glory that was about to come. 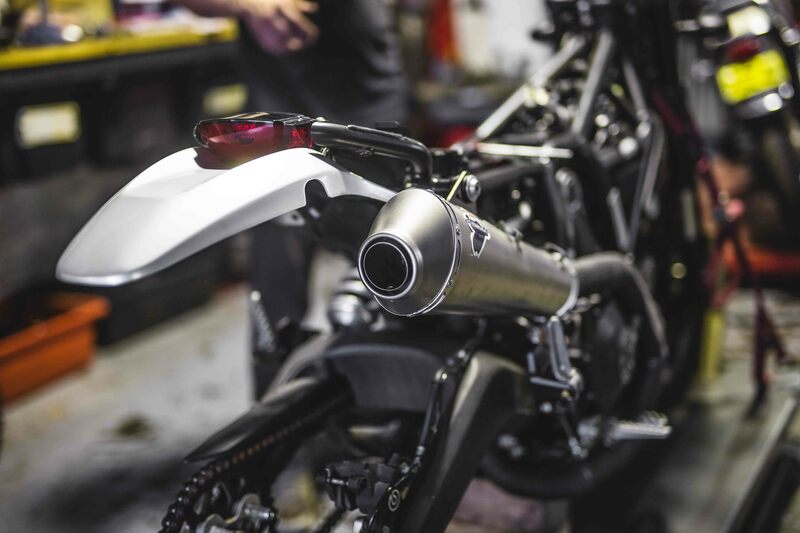 With the tank now on and the aluminium guard kit from Ducati treated with our secret method we on to the final stage, the hand fabrications. 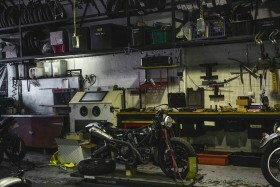 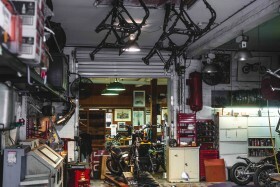 We threw the bike in the back of the van and made our way through the concrete tunnels and highways of Sydney and landed at the front door of MotorRetro! 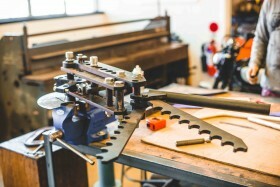 Using the right tools makes any job higher quality and much easier to finish and they have everything for metal shaping. 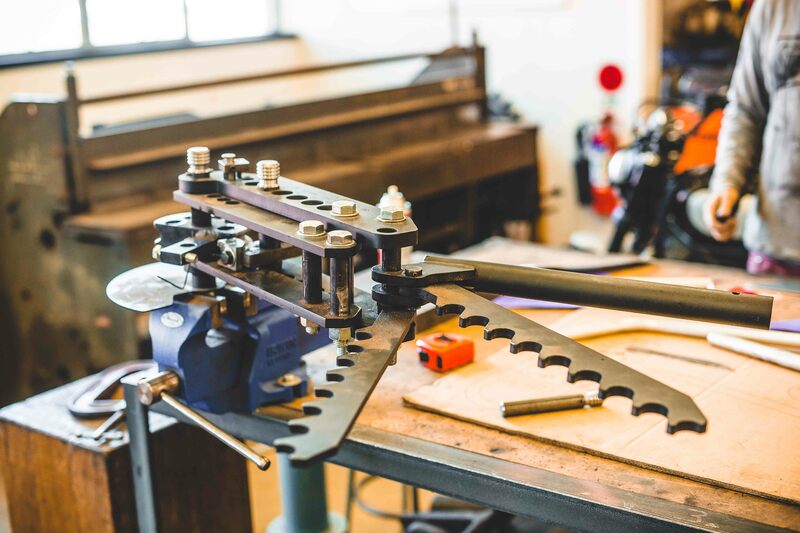 From hand dollies to industrial benders they have it all. After chatting about the jobs they currently are doing and admiring their craftsmanship we jumped into gear and got cracking into the Scrambler. 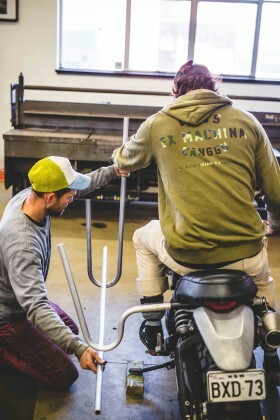 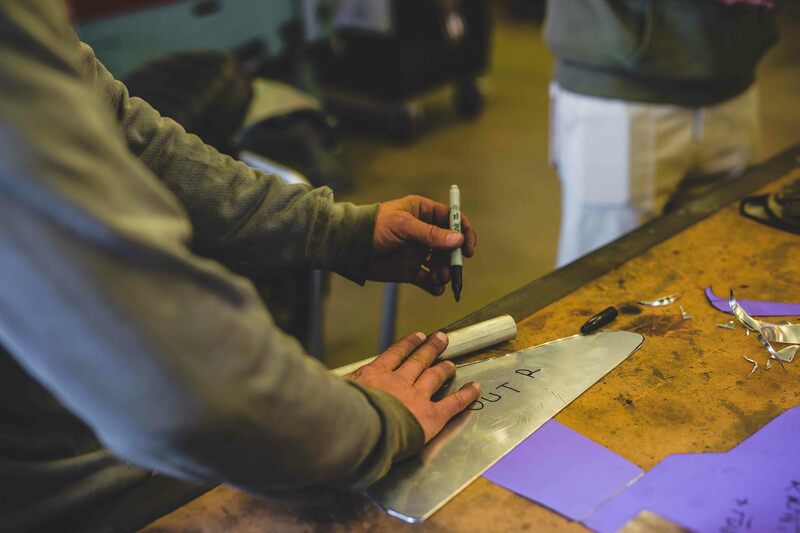 The surf racks were measured and bent into shape using a pipe bender and then finished off by cutting them to length. 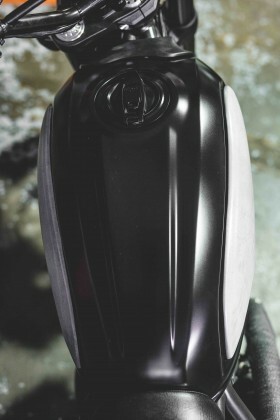 Once this was punched out we formed the side covers using 1.6mm aluminium sheet and some specialist machines that a regular person wouldn’t know the front from the rear. 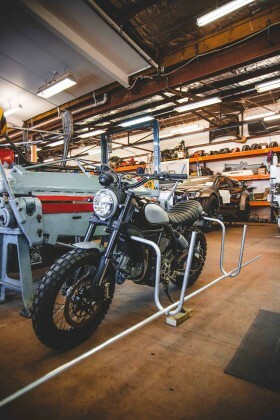 The surf rack and side covers were then completed at The House. 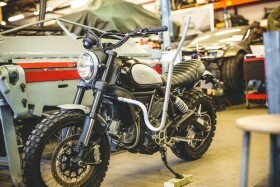 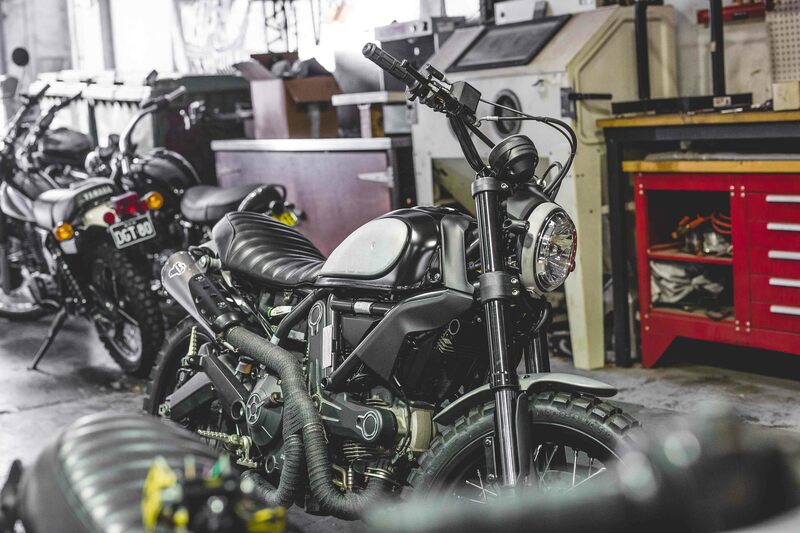 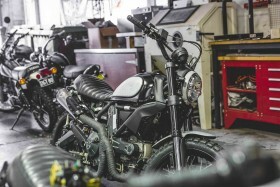 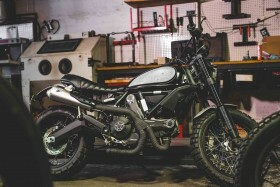 This once generic Scrambler is now formed into a black beauty of customisation and imagination. 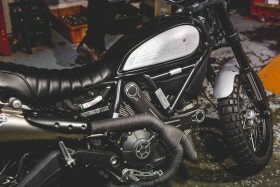 We hope to see more owners take advantage of the parts available straight from Ducati by seeing now what is achievable with a bone stock Scrambler ICON. 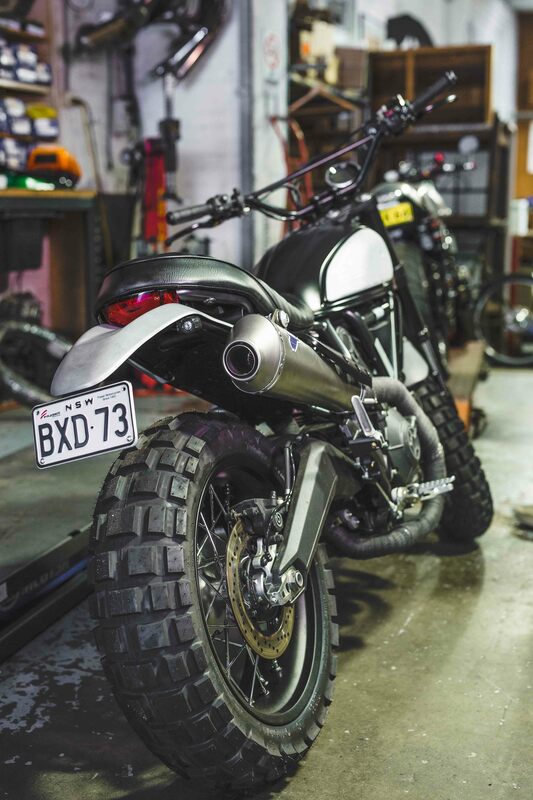 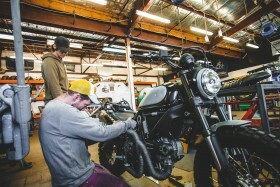 A huge thanks to Ducati Australia and New Zealand for the iconic Scrambler and Transmoto for capturing the process.